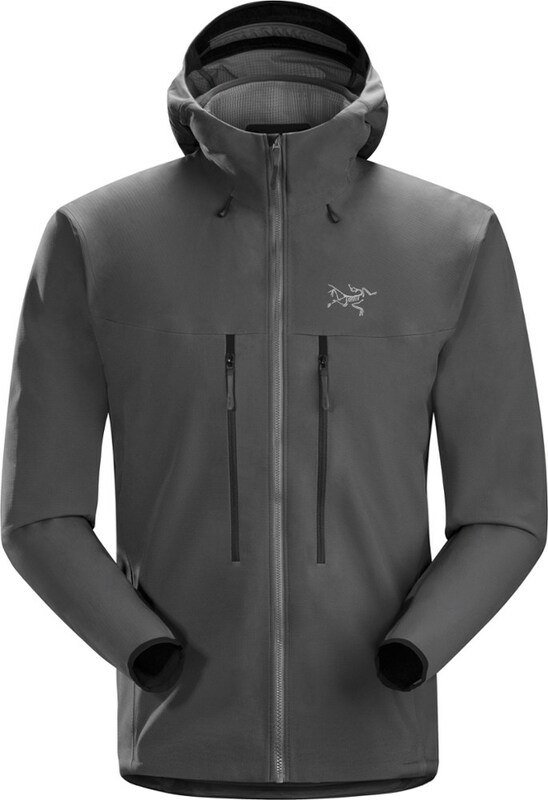 Lightweight hybrid jacket—part fleece, part softshell for wind resistance. Intended for runners and cyclists, but also useful for walkers. 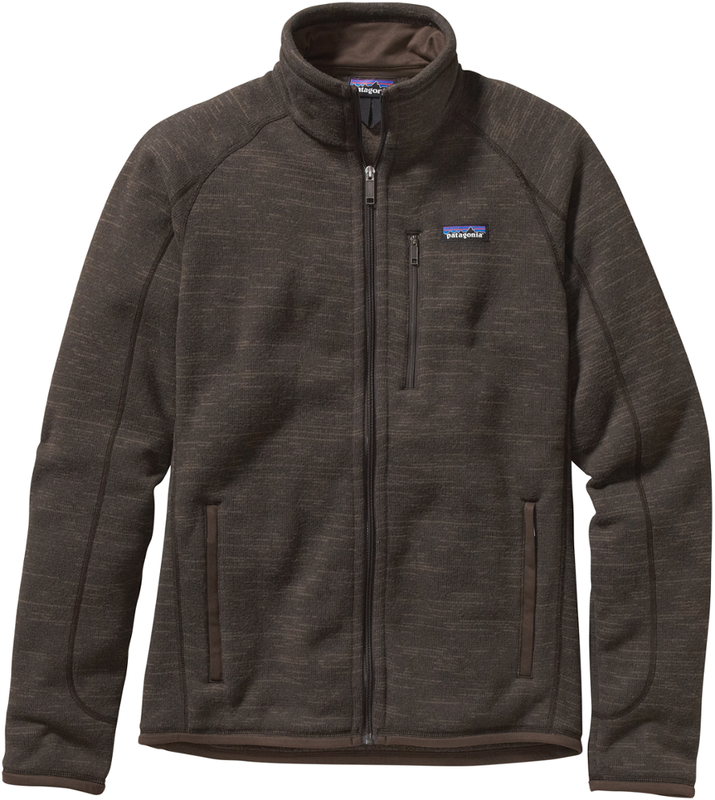 The Gravity Trail fleece jacket by German company Jack Wolfskin caught my eye for two reasons. First, it has elevated, rucksack-compatible pockets. Elevated pockets are a common feature on rainjackets and softshells, but very rare on fleeces for some reason. Second, the front of the Gravity Trail is made of what Jack Wolfskin claims to be windproof material. I would have found this useful during my expedition to Ireland in May 2018, when I spent a day walking into a cold wind that cut through my fleece midlayer. I had to wear my rainjacket over my fleece to keep the wind out. The Gravity Trail is actually made of three types of material. 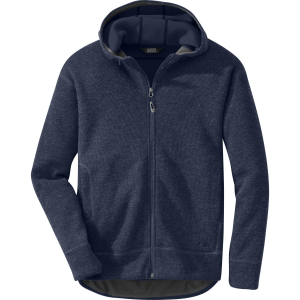 The sleeves and back are made of a thin, smooth-faced fleece material. 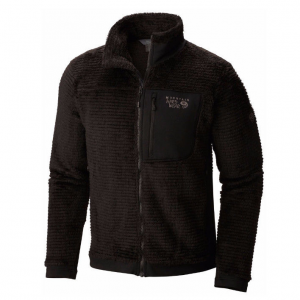 The front is made of a lightweight softshell, with a storm flap under the zip. The sides are mesh for ventilation. 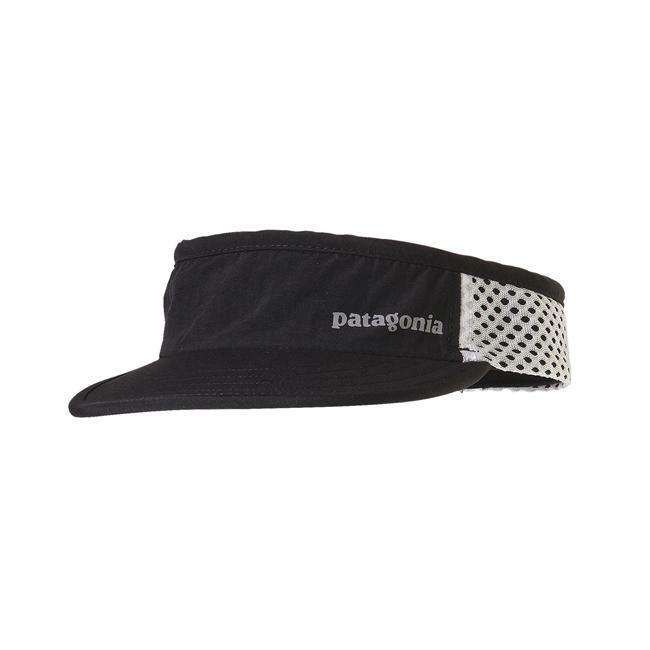 There is also a mesh panel running down the middle of the back—an excellent feature that should help reduce sweating under your backpack. Side view showing the elevated pockets, reflective strip to to the front, and mesh panel on the side (the black underarm strip). The jacket also has an angled hem, just visible in this photo, that drops deeper on the back. 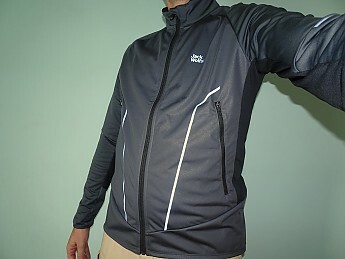 The jacket is aimed at runners and cyclists, and it has reflective strips on the front and the sleeves for visibility at night. I do not cycle or run, but I thought it should serve equally well for walkers, though I was not keen on the reflective strips. 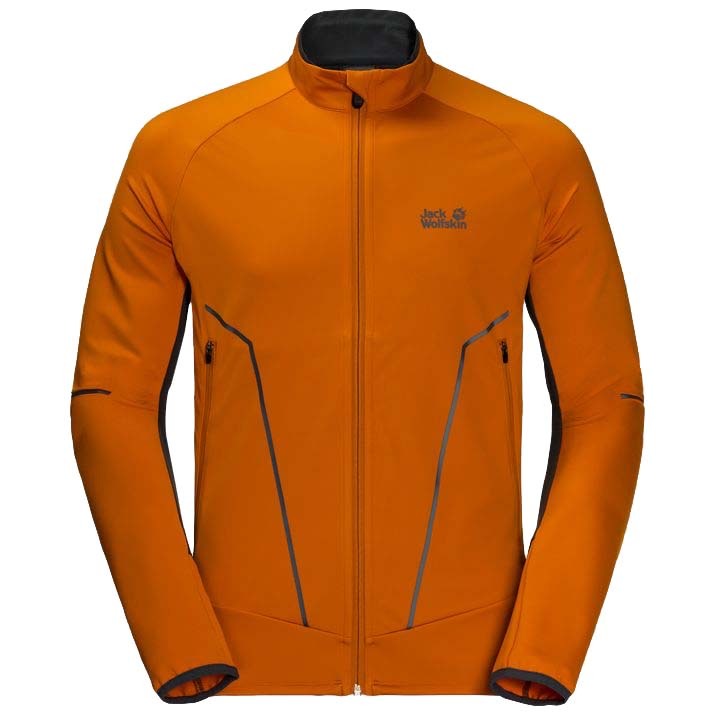 I do not like my outdoor gear to be flashy, so much so that I ordered the jacket in dark grey (the other options are blue and orange). But the reflective strips do not stand out under natural light. This photo was taken using flash, which makes the reflective strips and Jack Wolfskin logo stand out vividly. I am 6'1" with a 41-inch chest and I found the large size to be a good fit. It is close-fitting but not snug. It is lightweight, stretchy and comfortable. The sleeves are generous in length and I could pull them down to my knuckles if I wanted to, although they have no thumbholes to keep them in place. The pockets are excellent. They are map-sized, with large openings, and accessible when you are wearing a rucksack. However, the pockets extend down beneath the rucksack hipbelt, so putting a map in would be hard without unbuckling your hipbelt. Closeup of the front showing the storm flap to the right and the mesh panel running down the back. The mesh is so thin as to be translucent. I have worn this jacket in a stiff facing wind. 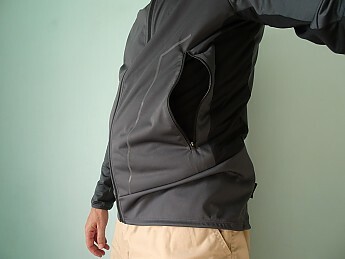 I could feel the wind on my arms but not my chest, so the softshell material on the front of the jacket seems to work as intended. The large weighs just 360g (12.7oz) according to Jack Wolfskin. In reality it is even lighter: mine is 336g (11.9oz). 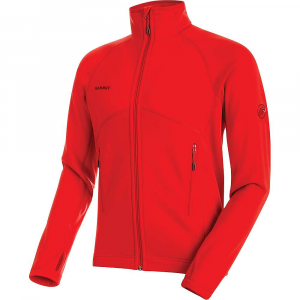 The light weight of this jacket makes it ideal for runners and cyclists, but walkers will not find it suitable for particularly cold weather. 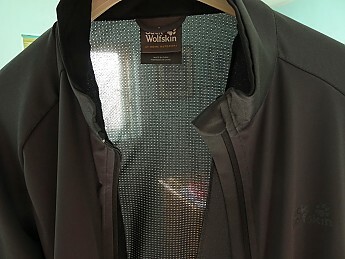 The jacket also feels delicate: I would not risk it walking through dense woodland. It does not pack into a pocket, nor does it come with a pouch or stuffsack, but it does fold down to a compact bundle. The jacket is expensive at £115 sterling. I got mine at half price, otherwise I would not have bought it. Thanks for the review, Charles. Jack Wiolfskin has been trying to expand into the North American market over the past few years, so it's good to hear your thoughts about their gear. The Jack Wolfskin Gravity Trail Jacket is not available from the stores we monitor.